Posted in: Writing Exercises. 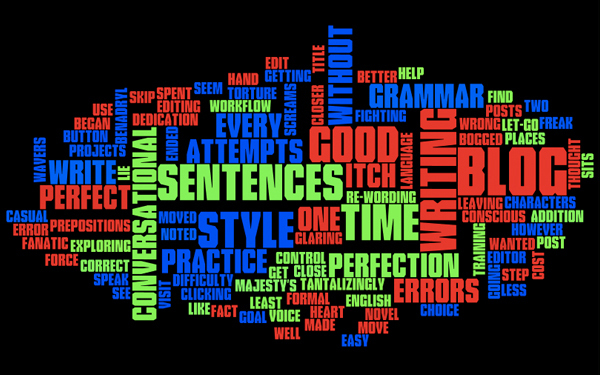 Tagged: casual language, control freak, grammar errors, writing exercise. When I began writing this blog I made a conscious choice to use casual language. I wanted to write in a conversational style without getting bogged down with attempts at perfect grammar. I am, at heart, a control freak and I thought this conversational style would help me to let-go of attempts at perfection in my writing. Does that seem like an easy goal? Well for me it is torture. In at least two places in blog posts (can you find them?) I have ended sentences in prepositions. At the time I noted the fact and moved on with some difficulty. Re-wording the sentences would have cost me workflow and editing time better spent on my novel projects. In addition it is good practice for me to write in a less formal style. Not every one of my characters is going to speak in Her Majesty’s perfect English, so leaving the grammar errors lie is good practice in exploring voice. However, my dedication wavers every time I visit my blog and see these glaring errors. My training as an editor screams (WRONG!) and I have to force myself to skip over the sentences without clicking the edit button that sits tantalizingly close to the title of each blog post. I itch to get in there, correct the error and move one step closer to fanatic perfection. I am fighting the itch (Benadryl in hand) for the good of my writing. There are rules to writing. Grammar, spelling, flow and style, rules surround us. Most of the time these rules are of great help. Readers expect to understand our writing and obeying common writing rules will help that understanding. However there are times when the rules bog us down. When the desire to edit while we write overpowers us and gets in the way of flow and the creative process. Take a moment to break a writing rule. Heck, break a bunch of rules, break as many as you can in 250 words. “But wait. Won’t that just be jiberish?” Ahh, in that question lies the real challenge of this exercise. Challenge yourself to write 250 words, breaking as many rules as you can, while still delivering a coherent message to your reader. NB. This exercise is a great way to become familiar with a grammar rule that has plagued your writing in the past. If there is a grammar rule you don’t understand or routinely break, make sure to include it in this exercise. Sometimes playing with a rule is a better memory tool than rote memorization. Breaking rules successfully means you have to understand those rules. Happy writing.